Whew. I think things are starting to quiet down. It’s been a crazy/fun/busy year for our little company. At this time last year, it was just Cashman and me wandering around the windy streets of Boston with a Yesware prototype. Now, we’re three co-founders, five full time people, great contractors and partners, amazing investors and almost 5,000 users of a quickly evolving service. Now that’s a good year! It never would have been possible without you: our customers, friends, supporters, advocates, advisors, critics and fans. 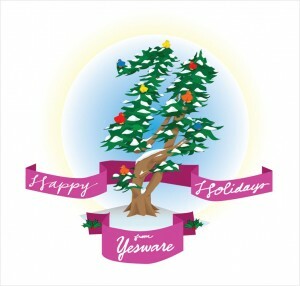 As you pause at the end of the year and take stock of all you’ve been through and accomplished, please spare one moment to savor the gratitude that all of us at Yesware feel towards you. It’s not easy to start a company – it requires hundreds of events coming together at the right time. You probably know what you did to help Yesware along, but you can’t know how much it means to all of us. Thank you. And have a great holiday season.